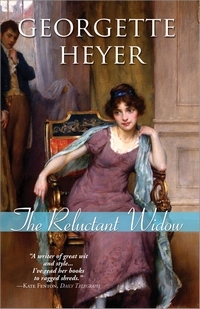 The Reluctant Widow, first published in 1946, was Heyer’s 32nd novel and her 17th Regency. It was my first Heyer, and it hooked me completely. I confess that I sometimes find it hard to differentiate one Heyer story from the next. The headstrong heiresses and their plights tend to merge in my mind over time, but the heroine of The Reluctant Widow is different. She’s still plucky and headstrong, but Elinor Rochdale has an appeal that transcends the other Heyer girls. Maybe it’s the fact that she is a working girl, albeit one with pedigree; maybe it’s her inherent honesty. You get the feeling that she simply couldn’t lie, however much she wanted to. Unlike so many other Heyer heroines, Elinor is not a schemer. She doesn’t have an agenda, other than to live decently and without a lot of fuss. She’s not out to hoodwink, bedevil, dazzle, or charm anyone, and this makes her so very appealing as a heroine. The mystery of the novel involves Elinor, Carlyon, and his flighty, tonnish brother Nicky figuring out what the heck is going on in the ramshackle house, Highnoons, which Elinor inherited when her husband died but a few hours after marrying her. Catherine Morland types will be delighted to know that the house comes complete with hidden staircases, secret entrances, and other wonderfully “horrid” attributes. The Reluctant Widow is a perfect combination of mystery story and romance. Unlike so many of Heyer’s Regency Romances, it is not just about how a worthy young woman finds the right husband, but it provides a breathtaking historical whodunit as well. Was Elinor’s late husband a spy for Napoleon, or was he just caught up in a web of treachery beyond his understanding? Will Elinor, Carlyon, Nicky, and his incorrigible hound, Bouncer, find the missing documents that detail the British army’s plans for the summer campaign before they fall into the wrong hands? Heyer was absolutely at the top of her game when she wrote this novel—the dialogue sparkles, the plot is watertight and intricate, the red herrings are fresh, and the characters are interesting and comfortably recognizable without being stock. It’s a pleasure to read such a perfect specimen of a genre. The Reluctant Widow is one of only two Heyer novels that have been made into movies—the other is Arabella. The movie version of The Reluctant Widow, which was made in 1950, can be viewed on You Tube, and you can access it here. I have yet to find anyone who hasn’t declared it simply awful, which is such a shame because The Reluctant Widow, like so many other Heyer novels, would make an absolutely terrific film. Watch the movie if you dare, but make sure you read the book first! Jane Greensmith is a lifelong devotee of classic literature who loves a good story and is always on the lookout for great writing and interesting perspectives. She’s the author of Intimations of Austen, a slim volume of backstories, sequels and what-ifs for the Austen oeuvre. When not reading, writing, or working, she coaxes plants to grow in the semi-arid Colorado soil, starts and occasionally finishes quilting projects, and fantasizes about time travel. She named her blog Reading, Writing, Working, Playing so that could write about anything that strikes her fancy without danger of being accused of going off-topic. You can follow Jane on Twitter as JanetGS. Enter a chance to win one copy of The Reluctant Widow, by Georgette Heyer (Sourcebooks, 2008) by leaving a comment stating what intrigues you about the plot or characters, or if you have read it, which is your favorite character or scene by midnight Pacific time, Monday, September 6th, 2010. Winners will be announced on Tuesday, September 7th, 2010. Shipment to continental US and Canadian addresses only. Good luck! Everything about the plot intrigues me, especially how Elinor ends up marrying a scumbag only long enough for him to die and leave her his wealth. I loved some of Heyer’s more popular titles, “The Grand Sophy,” “Frederica,” for a long time. But along came “The Reluctant Widow,” which IMHO is her best. This book delighted me with it’s gothic descriptions and dark passageways, but for all that darkness there is so much light in the characters, the humor, and the many absurd situations they find themselves. It was like “Rebecca,” but with a sense of humor! It has become a keeper shelf comfort read for me. Somehow I’ve missed this one…I’d love to read it. The gothic flair sounds like a lot of fun! I love your description of the heroine! She sounds like she’s very refreshing. Bouncer is probably my favorite character in all of Heyer. She writes awesome dogs, but he’s the best! I really loved the first half of this book but found the ending a bit anticlimactic. I have seen most of the film, which really isn’t that great, but having a weakness for black and white I watched as far as I could, when the YouTube episodes ran out. Do you know if the entire film is now available or does it still end about 2 3rds through? Fabulous review Jane! It’s been well over a year ago since I read and enjoyed this novel. Hard to remember specific scenes, but I do have a mental picture of the start of the novel when Elinor realizes she is not at the correct house – confusion and bewilderment. I found the gothic tone of this one off putting for a long time. I enjoy it now, but I don’t think I’ll ever class it among my favourite Heyers. Elinor falls a little flat for me, as does Carlyon – if anything, they’re too perfect. I do love Nicky though. This was my first Heyer too! I loved it and so began my devouring of her other novels. I am a mystery as well as a romance reader, and I love the mystery element of this novel. Nicky and Bouncer are my favorite characters. Yet another Heyer novel I’ve missed. Something to look forward to! I loved how such a simple mistake of getting into the wrong carriage turned Elinor’s life dramatically around. Wonderful review! I may have read this years ago and would love to read it again. I have been happily reintroduced to Heyer through the audio books read by Richard Armitage! I would love to see this movie remade with him as the hero. Unfortunately this is one of the very few Heyers that I do not like and thus only read it once, I believe that if it had not been for Nicky and Bouncer I might not have even finished it. Yes it is a combination of mystery and romance, but in that area, I had already been spoiled by The Talisman Ring, which I infinitely prefer. That also means that I disagree with Jane’s review a bit. First of all, IIRC it was Heyer’s 33th novel and it was her 6th Regency (since only Regency Buck, An Infamous Army, The Corinthian, The Spanish Bride and Friday’s Child preceed it). For me it is not difficult to differenciate the heroines, granted they can be grouped in general types, but each and everyone has her own personality (that is one of Heyer’s stronger points, characterization). There are few headstrong heiresses (Judith, Serena, Sophie perhaps, who else…?) as for working girls like Eleanor we also have Ancilla, Kate and to a certain degree Deborah. Furthermore, which heroines do you consider schemers? Maybe Sophie or Frederica but they are schemers in the negative sense of the word IMHO (in fact they are among my favourite heroines). I still think that Heyer was trying to find her style with the Regencies with this one, her finest were to come in a few years. Cinthia – I’m not a Heyer scholar and confess that I simply counted how many other novels came before it in the list of works posted for Heyer on Wikipedia–I may have miscounted or the list may not have been completely reliable with regards to order. I actually haven’t read that many Heyer’s–two mysteries, and a handful of Regencies. That said, RW remains my favorite and I was simply trying to articulate why it appeals to me and why I enjoy rereading it. Thanks for explaining, Jane :). I’m sorry if my comment seemed harsh, but because of your enthusiams for the book I sensed you were disparaging both Heyer and her other novels as a whole, as if you were saying she wrote very similar novels and heroines. But now, it is clear that you refer to only to the handful of novels by her that you have read and thus your ‘many’ is not a general ‘many’. Corrigendum, when I asked about the schemers, I mean to say that maybe Sophie and Frederica might be seen as those, but NOT in the negative sense of the word. As it turns out, The Grand Sophy and Frederica are among the handful of Heyers I have read (along with Cotillion, Sylvester, and Spring Muslin), so I shouldn’t have been so generalizing in my comments. I do like Sophy quite a bit, and have enjoyed all the Heyers I have read. The great thing about this month-long set of reviews is that I have a reading list a mile long of Heyers that I must read! So many things intrigue me! Wonderful review, Jane! You have such a way with words! The heroine sounds fanastic and I love that there is a mystery involved too! I love Gothic novels and Regency stories, and this sounds like the best of both. I will certainly read the book before watching the film (thank you for the link!). Your description of the heroine particularly interests me. This is one of my favorites which makes it such a shame that a lot of people skip over it because of the bad movie. Elinor is one of Heyer’s best heroines, which given her superb talent in creating characters is saying something. I disliked the gothic aspect of this, but loved the main characters – I think my favourite scene is when Bouncer “guards” Elinor. I enjoyed your review. Especially, “Turns out the cousin is a hero of the first order, Lord Carlyon, but Elinor finds him “odious,” which is actually Heyerian code for “simply irresistible.” So very true!!! I really enjoyed this romance. I loved the chemistry between the hero/heroine. This was my second Heyer read, I also really loved it! Especially the character of Bouncer who was so dog-like and he added an extra dose of humor. He was so mischievous while trying to be loyal. I too loved the mystery weaved into this one! This is one of my favorite Heyer books I have read so far. I absolutely loved the hero Lord Carlyon in this novel; I must confess I have a crush on him. Elinor is also that sensible no nonsense Heyer heroine and who could forget Bouncer, the ireppressible dog who always made you laugh with his antics. This is one of hers I’ve somehow missed! Which I’m regretting majorly right now, as it sounds intriguing. Sounds like so much fun! I want to read this one! I’ve been reading the reviews this month making a mental list of which Heyer books to read first. This shot straight to the top with the mention of spies in the Napoleonic wars–that’s a major weakness of mine. Wow – what a great review! I’m intrigued by the gothic elements (and reference to Catherine Morland) as well as the mystery in The Relutant Widow. This is one of the Heyer novels that I have not yet had a chance to read, but would love too! I love Elinor’s sense of humor, and the interplay of word with Carlyon. Ooh, I love a good ‘governess as heroine’ story, and this plot sounds just up my alley. Moving this to the top of my to-read list. It’s been a long time since I read this one, but I do remember enjoying it. Elinor is a fresh heroine, and her and Lord Carlyon are very likeable. It’s always fun when a person finds out that the reported villain is actually the good guy. Wow, this review’s description of the heroine makes her sound really interesting and likable. Can’t wait to read this one! This one sounds delightful! You can’t really go wrong with some gothic touches and a heroine not entirely prone to scheming! Many elements in this story make it one I think I will love; the mysterious Gothic atmosphere, the romance and the stellar sparkling dialogue Georgette Heyer is famous for. Great review! I am now rereading TRW, and I think I know what I don’t like about it. It is major flaw in the premise of the book that teased me when I first read it. At the very beginning of the story, when Carlyon explains his plan, and it is at once evident that he and Elinor are bound to fall in love, I thought that the conflict in the story, the complication that would stand in the way of true love, would be the obvious fact that if Carlyon marries the widow, he inherits the estate (through her) and undoes all his work. Obviously he it was all just part of his nefarious plan to inherit Highnoons (how’s that for the name of an estate?). But this problem he dismisses without a thought, which somewhat brings into question all his urgency to have her inherit in order to free him of the suspicion of coveting the (grossly encumbered) estate. I think that GH had this wonderful idea in her mind to create a situation where the heroine is married and widowed at the outset, but she just didn’t try hard enough. I think that the whole missing-document-prowlersin-the-night scenario failed to live up to my expectations as a substitute for the hero-cannot-possibly-marry-the-heroine situation I had begun to imagine. This is my favorite Georgette Heyer novel. I love the mix of mystery and romance. I have to experience Elinor, she sounds intriguing. OK-this is another one I have to try again. Maybe the mstery and Gothic overtones will appeal to me this time! Elinor does sound very interesting.